Navigation can be customized globally, for all users, by using the settings.aspx page. It can also be customized on a per-user basis. The two pages which are generally affected most by navigation are the report viewer and the report list. By creating a page with these links, you can completely control the Report List navigation. You can also display buttons or other links which further control navigation or integration with your product. Portable Document Format (pdf): "&output=pdf"
Simple Mode disables the ability in the Report Viewer to load another report, export the report, or add fields and filters to the report. If there are existing filters it allows the ability to change the current filter. **Note: The values in "Red" (p1value, etc.) above are for reference to the information below only. The Value(s) spaces need to remain "Blank" in the Report Designer. 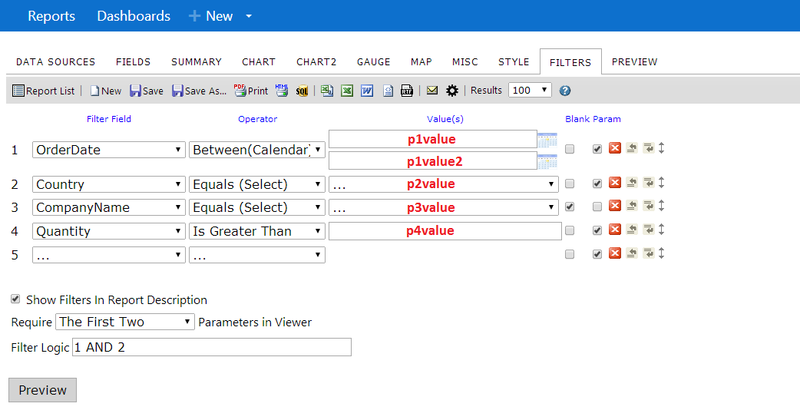 Note: p1value2 is only valid due to using the "Between" operator and would not be valid when working with other operators. All of the above commands can also be accomplished by replacing ReportViewer.aspx with rs.aspx and appending the appropriate query string. This will generate the same report seen in ReportViewer.aspx but without any of the menu items.